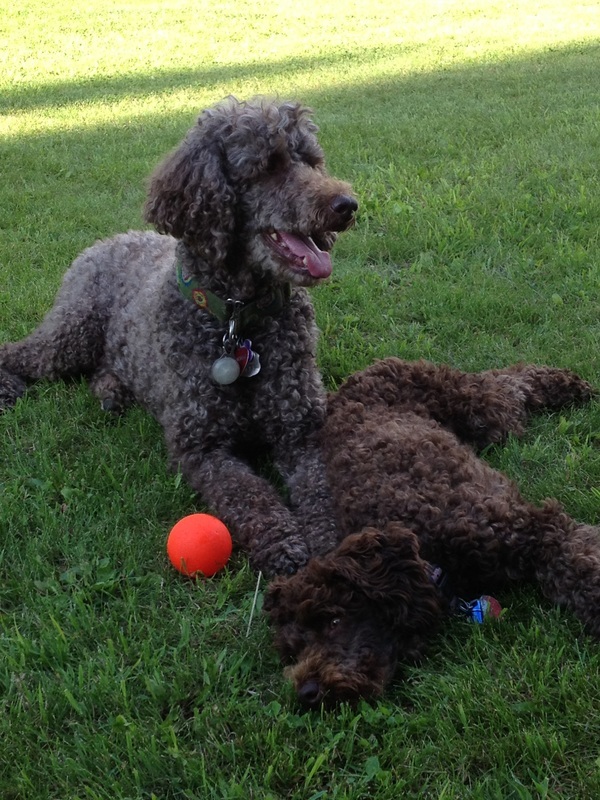 In December of 2008 I had the privilege to adopt Gemma, a standard poodle with a cinnamon & sugar coloring. Gemma was a puppy mill rescue (estimated to be between 2-3 years old) and was in pretty rough shape due to a very poor quality of life. She hadn't been walked or played with, living her days in a small cage where she ate, toileted herself and nursed her pups before they were taken from her. Gemma didn't know what human kindness was before she was rescued as it was humans who exploited and otherwise neglected her for those first few years of life. It took an intensive year of rehabilitation before the dog I adopted transformed into a beautifully secure, healthy and happy companion. I have to say that I had learned a lot during that year about resiliency and the therapeutic benefits of working so closely with animals. A year or so later, during my internship at Elizabeth Fry Society I had a client who struggled with her own history of trauma and I brought Gemma in to meet her. This session was a catalyst for change with my client, learning to become confident, assertive, establish boundaries and a self care regime. Witnessing the amazing influence of utilizing Animal Assisted Therapy in Counselling inspired me to dive into professional development and independent study on the field. In 2012, West Coast Assistance Teams in British Columbia assessed/ screened and certified Gemma and myself as a Therapy Team. We have since relocated back to Ontario where both Hazel (who joined us later in 2012 as a puppy) and Gemma have been utilized in a clinical capacity, working in the context of Animal Assisted Therapy in Counselling over 13 months while contracted by The London Family Court Clinic with myself as Clinician and Handler. My position as a mobile Clinician enabled us to go to a variety of settings to meet with the youth such as Youth Justice custody settings, group home settings, therapeutic residences, educational settings, and elsewhere in the community. Since then, Hazel (and myself) has undergone additional training via Thames Center Service Dogs in time to represent the AAT in C Chapter at the 2015 Canadian Counselling and Psychotherapy Association's Annual Conference.